As previously publicised here, this weekend is to mark the anniversary of the murder of Jo Cox, MP, by showing we are NOT divided by faith, culture or ethnicity. On Saturday 17th June from 1:30 pm onwards, St Mark’s Church is holding a community event that includes a Bake-off Craft Fair, Community Café and lots, lots more as part of the Broomhill Festival. Judging of the Great Broomhill Bake-Off will run from 2 – 2:30 pm. If you want to enter please have your bakes at St Mark’s by 12.30. The rest of the community event will start at 1:30pm with the Cafe then open all afternoon with musical interludes. For more details about entering the Bake-Off please contact Jane Padget at St. Mark’s Church, or email jane@evaconsulting.co.uk or mobile 07921863281. We need notice if you wish to enter the Bake-Off. In celebration of Jo Cox’s belief that we have more in common than that which divides us, a community party and picnic is being held at Heeley City Farm on the 18th June, from 11:00 AM to 3:00 PM, supported by HOPE not hate, Amnesty International, ASSIST Sheffield and City of Sanctuary. There is an exciting programme of events, with storytelling, poetry, speakers, sports, games and activities. Music and dance acts will showcase the wide range of cultures in Sheffield. The event is free and open to all and we encourage people to bring and share picnics. Brendan Cox said ‘[Jo] would hope that all of us make a resolution to do something in 2017 to bring our communities back together’. There will be a one-minute silence at 1 pm in memory of Jo Cox. Let Us Know You Plan to Come! You don’t need to reserve a place, but it helps us estimate how many people will come. If you know of other events, please let us know and we can publicise them here. Sheffield Interfaith is not organising any events, we shall join the above, and encourage to you to do so too. 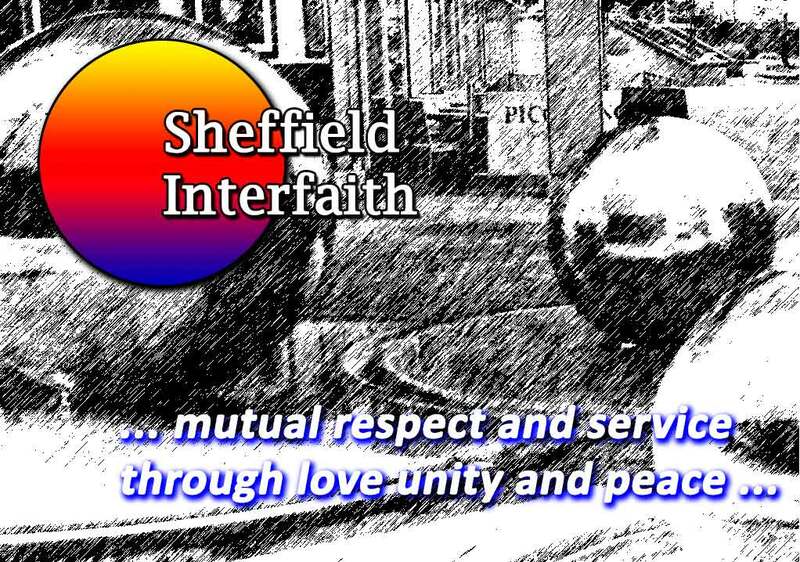 If you want to support Sheffield Interfaith then why not consider becoming a member. As a member you not only provide some financial support for us, but you can help develop what we do, and help us in our work. There are two ways to become a member. By Internet banking Send your payment to our account – Sort Code 40-41-07 / Account number 42022273. Please use your surname as the reference and then email us at sheffield.interfaith@hotmail.co.uk (You can set up a Standing Order this way). Remember to include your Name OR the Name of your Organisation. Honouring Jo Cox – Great Big Walk and Great Get Together – 16 – 18 June. On the weekend of 16-18 June, the anniversary weekend of the murder of Jo Cox, former MP for Batley and Spen, the Jo Cox Foundation is organising what it hopes will be the biggest street party since the Jubilee: The Great Get Together. Organisers say “Jo’s killing was meant to divide us and we think the best response is to show how united we are. We believe there is a groundswell of people who reject divisive politics and simply want to bring our communities together and celebrate all that unites us. This is our chance.” Their hope is that this weekend of community events will demonstrate how united people are. The events are being supported by the Big Lunch, the Big Iftar, the Eden Project, the Inter Faith Network for the UK, the Church Urban Fund, and organisations of a range of different faiths and beliefs as well from across the broad spectrum of society. Your event can be held at any time over the three days. For further information and to take part, visit pledge.greatgettogether.org. You’ll then be sent an information pack. You can also email Mike Buckley at the Jo Cox Foundation (mike@moreincommon.co). If you are holding an event, please do also keep the Inter Faith Network in touch. The Big Lunch and the Eden Project are organising The Great Big Walk to tie in with The Great Get Together. Five teams of two walkers will walk from Batley in West Yorkshire to Scotland, Wales, Cornwall, London and Northern Ireland. Walkers will start in May 2017, arriving for a Big Lunch / Great Get Together event on 18 June. Each day walkers will be visiting community groups along their route to shine a light on the people and projects fostering community spirit. They are looking for ten lead walkers and a support team for each of the five routes. If you would like to take part or know someone who would like to get involved, further information can be found at https://www.edenprojectcommunities.com/blog/take-part-in-the-great-big-walk. The story of St George is about good and evil and living a faithful life. This evening will be a ‘show and tell’ event to share hurdles or problems people have met/overcome through faith or along their faith journey. No dragon will be harmed or, even, present. Barbara Glasson is the Team Leader of the Touchstone Centre in Bradford (a majority Muslim City) http://www.touchstone-bradford.org.uk and Deputy Chair of the West Yorkshire District. challenge injustice. Touchstone has worked for 30 years in the heart of Bradford and is a key-player in interfaith work both locally and nationally. By our own efforts and the generosity of many people and Churches we have raised nearly 80% of the capital needed to move into new premises and to continue to grow and develop our work. We’re nearly there but we need your help to bridge the gap …… we believe we can do it, but we urgently need your help!If you can help us, with a one off donation or regular gift please complete and return the form (downloadable from the website) to Touchstone, 32 Merton Road, Bradford BD7 1RE http://www.touchstone-bradford.org.uk (01274 721626) Thank You! You can also become a friend of Touchstone and help them continue their work as a centre of excellence for interfaith understanding and dialogue; again, find the form on the website. Chaitra Shukla Pratipada is first day of the Chaitra month to mark the beginning of New year according to the lunisolar Hindu calendar. According to Brahma Purana, this is the day on which Brahma created the world after the deluge and time began to tick from this day forth. This day is celebrated as New year in many parts of country. 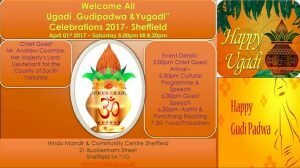 This festival is called Gudi Padwa in Maharashtra, Samvatsar Padvo amongst konkanis in Goa and Kerala, Ugadi in Andra and Telangana, Yugadi in Karnataka, Nevrah amongst Kashmiri Pandits and Cheti Chand among Sindhi people. It is also celebrated in the North-East state of Manipur where it is known by the name Sajibu Nongma Panba Cheiraoba. 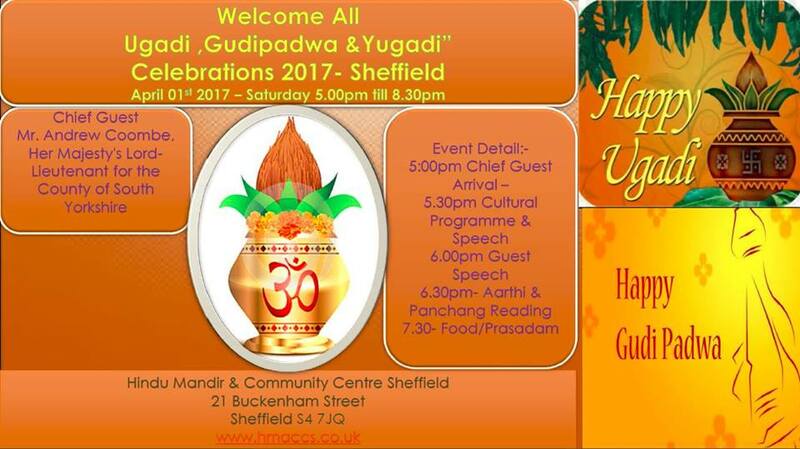 We are celebrating Gudi Padwa /Yugadi / Ugadi festival at our temple on Saturday 1st April 2017. For festival details please see the poster. Yesterday’s attack at Westminster on police and members of the public exemplified the cowardly and destructive nature of the actions of terrorists. We hold in our prayers all whose lives have been lost or forever changed through the murderous acts of its perpetrator. Let us also watch out for the wellbeing of any groups who may be targeted because of terrorist actions which claim, or are perceived by some, as having a link to them. There is no place for prejudice and hatred of that kind and where it is found, let us redouble efforts to combat it.